Poison Free 12-month Rat Free Warranty! Nature First Pest Control’s rodent exclusion locked him out and he’s leaving town. We restore the health and correct the rodent damage to your home. Denying rats an entry is the first and most important step in eliminating them. 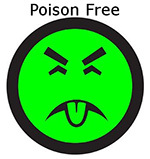 We offer “NO POISON” total rat extermination with guaranteed results. Stay away from any company that puts out bait and assures you that the rodents will leave your house and go to water. This is total BS. We use no bait. We seal the entry points and guarantee the results for one year! We are the only rat exterminators in Portland that offers this guarantee. The main attractions for rats and other undesirable wildlife to your home are bird feeders, pet food left outside, and garbage cans that are not sealed. Other attractants include overgrown areas, thick landscape vines, wood piles, sheds and outbuildings, bird baths, landscape walls and berms. When we get a call about a problem in a home, I always ask the homeowner whether they have a bird feeder. This is the most common way to attract rats to the side of your house. If you keep feed in the feeder constantly, the rats will eat all they can and then want to hide the rest. This often results in smooth looking burrows alongside of your foundation. If you have just a crawl space they will quickly dig under the foundation and gain access to your home from underneath. If you have a very deep foundation, basement, or a slab, they will look for other entrances. There are usually torn vent screens, badly fitting garage and side doors, gaps around pipes entering the house, dryer vents, and sometimes pet doors. The same thing happens when you leave pet food outside. They will eat all they can and look for a place to store the rest. We have found burrows under Rottweiler and Doberman dog houses. So don’t think that rats can’t get to that food. If you think that having a cat will keep the rats away, think again. Most house cats will stand and watch a rat feed at its food dish. While they can catch mice, they often play with them and allow the mice to escape. Those cats were never trained to hunt, and are too well fed to feel like taking on a full grown rat. Another classic mistake homeowners make is to store pet food in the garage in the bag it came in. Sooner or later, they will find this treasure trove of food. Put this food in metal cans and close the lid. Super Rat and Mighty Mouse Question? What animal can leap five times its body length straight up? Can squeeze through any hole that it can get its skull through? Can dig tunnels straight down without leaving dirt around the hole? Can chew through wood siding, door jams, and wall board in minutes? Can swim under water for great distances? Can climb the inside of smooth vertical pipes, thrive in total darkness, and gain weight on a diet of dog droppings? That’s right. It’s Super Rat. More commonly known as the Norway or Wharf rat. The Norway or Wharf rat is commonly found throughout the country along with his cousin the Roof Rat. While as a human it is nice to be needed. It is just not nice to be needed by rats. The various rat species that we are familiar with are called commensal rats. This means that they need mankind to survive in our environment. They go wherever we go, eat whatever we or our pets eat, and have adapted extremely well to our civilization. In sewers, grain elevators, factories, ships, farms, homes and even submarines, you can find rats who are doing very well. Like all of God’s creatures, need food, water, and shelter. Provide these three necessities at your house, and they will come. Don’t ever think that your neighborhood doesn’t have rats. All neighborhoods have them in varying numbers. The trick is to let someone else give them a home. Don’t attract them to yours. Roof rats arrived in Portland a few years ago and have become a huge pest control issue. Roof rats often use the holes that squirrels have opened on your roof. Removing rats from your Portland area attic can become complicated. Rats usually have access to the entire house when they enter via the roof. We exterminate rats in your house in a logical sequence designed to avoid making rats trap shy. We rely on permanently blocking rats out from your house as the core of our rat control services. We use no poison baits. Nature First Pest Control has found that repairs to the roof need to be done right, or the rats and squirrels will, over time, chew open another entry for the rats. Rat control requires that the entire house be closely inspected. We offer crawl space cleaning and restoration services damaged by rodents. Green Eco-friendly Pest Control using Sustainable, Organic, Natural and Green methods. We safely exterminate Rats and Mice in and around Portland area homes and businesses. We are leaders in Natural, Green and Organic Pest Control Portland. We always try to exterminate naturally.